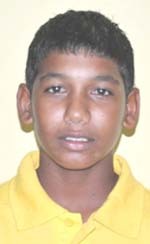 Guyana and Trinidad and Tobago recorded victories, while the Windwards and host Barbados played out a draw in latest matches in the Regional Under-19 three-day cricket Championship yesterday in Barbados. Guyana recorded a comfortable 96 run triumph over the Leewards, while T&T beat Jamaica by 3 wickets to rally up valuable championship points. Gudesh Moti-Kanhai bagged 11 wickets in the match for 116. Following are the summarised close-of-play scores on the final day of the first round of matches in the Regional Under-19 three-day Championship on Monday in Barbados. At Bayfield: Guyana beat Leewards by 96 runs. GUYANA 202 (Chanderpaul Hemraj 102; Tristan Hanley 6-48, Shevon Moore 2-30, Baker 2-25) and 156 (Ricardo Adams 42, Shawn Pereira 22; Tristan Hanley 4-68 – 10-116 in the match, Devon Baker 3-25, Shevon Moore 2-29) LEEWARDS 131 (Ashawn Hodge 49, Colin Archibald 40 not out; Gudakesh Moti-Kanhai 7-31, Romario Shepherd 2-32) and 131 (Hodge 25, Duan Webb 24, Dymon Parris 20, Akeem Saunders 20; Shawn Pereira 6-40, Gudakesh Moti-Kanhai 4-65). At Queen’s Park: Windwards drew with Barbados. WINDWARDS 206 (Jerlani Robinson 75, Holis Blair 33, Roland Cato 29; Aaron Jones 4-24, Chad Williams 3-41, Darnell Greenidge 2-29) and 202 (Keone George 58, Tarryck Gabriel 55, Jerlani Robinson 33; Darnell Greenidge 3-23, Jameel Stuart 2-8, Chad Williams 2-46, Chaim-Alexis Holder 2-59) BARBADOS 278-8 decl. (Shai Hope 101, Kemar Brathwaite 51, Darnell Greenidge 28, Jameel Stuart 21; Kenneth Dember 2-43, Larry Edwards 2-53) and 84-6 (Shai Hope 24; Larry Edward 2-17). At Friendship: T&T beat Jamaica by 3 wickets. JAMAICA 187 (Brian Gayle 35, Raghni Francis 31, Odane McCatty 25, Christopher Powell 25, Oshane Walters 24; Jovan Ali 4-59, Anthony Simmons 2-43) and 194-7 decl. (Brian Gayle 54, Tezwayne Creary 76 not out; Jovan Ali 4-55, Tevin Robertson 2-40) TRINIDAD & TOBAGO 203 (Jeremy Solozano 84, Brian Christmas 24, Andy Gobin 23, Vikash Mohan 23; Oshane Walters 5-49, Brian Gayle 4-29) and 180-7 (Jeremy Solozano 78, Brian Christmas 29, Andy Gobin 21; Oshane Walters 4-56, Brian Gayle 2-68).